Adding to its hip-length and urban style, the Chelsea parka adopts most of the features we know from Canada Goose: a 625-fil duck down insulation, a heavy-duty zipper, a storm hood and a waterproof shell. We can also find and interior pocket and two extra hand-warming pockets on the jacket. On the aesthetic side, Canada Goose went for a minimalistic and classic approach. Simple and elegant lines. The hood and coyote fur ruff are both removable. This coat is a great choice if you wish to stay extremely cozy during winter – while keeping an urban and versatile look. 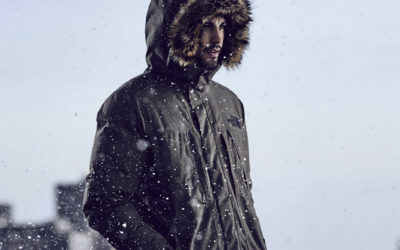 Just like the Chelsea parka, the Taya jacket is insulated with duck down duvet – but with a 655-fil. One of the features we notice the most is its simple and elegant look. However, it is not only about the style: this jacket will for sure keep you warm in cold weather. The removable hood is made from real asian raccoon fur – wich is an original detail. The collar, cuffs and waist are all elastic and ribbed, so that the wind can’t access the inside of the coat. The extensible lining and the water-resistant shell will protect you from snow and rain – while keeping the jacket warm and comfortable. The two pockets with zippers will also keep your personal belongings safe. Shop our collection of winter jackets for women after reading our Choosing the Right Winter Jacket guide and you’ll be sure to find your ideal winter coat this seasons!